Temporary immunity from 'ideological legal stunts' ahead of Livni London visit; Abbas freely visits despite Hamas unity. 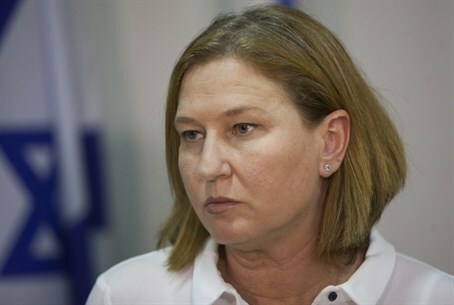 Justice Minister Tzipi Livni (Hatnua) has been given temporary diplomatic immunity by the British government ahead of her visit to London later in the week, in an attempt to shield her from "war crimes" prosecution. Despite her push for peace talks, opposition to "settlers," and opposition to a Basic Law enshrining Israel legally as the Jewish state, Livni has been threatened with British arrest warrants over her role as Foreign Minister during the counter-terror Operation Cast Lead. The Operation was conducted from late 2008 to early 2009 in response to massive missile attacks from Gaza terrorists. The British Foreign and Commonwealth Office (FCO) confirmed that "since the visit meets all the essential elements for a special mission, and for avoidance of any doubt on the matter, the FCO has confirmed consent to the visit as a special mission," reports The Guardian. A spokesperson for the British Crown Prosecution Service clarified that given the "special mission" status, "a magistrates' court would be bound to refuse any application for an arrest." In stark contrast to the diplomatic hoops Livni is being required to jump through in order to visit the UK, Palestinian Authority (PA) Chairman Mahmoud Abbas will freely visit London on Wednesday to meet US Secretary of State John Kerry in a "last attempt" to revive peace talks. Despite having torpedoed talks by signing a unity deal with the terrorist organization Hamas in late April, Abbas is set to visit England unhampered by legal persecution. Indeed the EU welcomed the unity deal, even though Hamas's military and governmental branches are on the EU's official list of terrorist organizations. This is not the first time Livni has had to deal with the threat of being arrested while visiting the UK. In October 2011 she was also given "special mission" status, after an application was submitted for her arrest over "war crimes." Livni was not so lucky in December 2009, when she was forced to cancel a visit due to an arrest warrant issued by a British magistrates court. Britain later changed the law on "universal jurisdiction" to require approval from the Director of Public Prosecutions before issuing a warrant for charges of international war crimes. Two other senior Israeli figures, Chief of Staff Benny Gantz and Maj. Gen. (ret.) Doron Almog, have similarly been hounded by British lawsuits for alleged "war crimes" in Israel's counter-terror operations in Gaza, and were both granted special mission status last year. Almog, a war hero from the 1976 Entebbe rescue mission, cancelled his visit to the UK last year despite the status. In 2008 he was forced to stay on a plane at Heathrow airport, after being told an arrest warrant had been issued against him, staying on board until flying back to Israel two hours later. British Prime Minister David Cameron, while visiting Israel in March, criticized the "ideologically motivated court cases and legal stunts" blocking senior Israelis from visiting England. "When I became prime minister, I legislated to change it. My country is open to you and you are welcome to visit any time," Cameron remarked.